You're a brave man Richard! Do you use an electrically heated vest, grips or gloves? I've just bought Gerbing G3 heated gloves for next winter. Temperatures only hit 0 deg C in our area for a handful of early mornings during winter but I'm a lot softer than you guys! I have heated liner, gloves, grips, etc. but didn't need them today. It was about 25°F (-4°C) this morning and didn't need any of them. Still using the fleece liner and the normal gloves though I do have grip covers (kind of like HippoHands). I'll probably start using the heated gear when the temperature drops a bit more. Regarding the plow controller, many people (including myself) just hang the controller from the lower left dash and leave it there. It's always in the same spot when I reach to push a button. When it snows I'm in the truck 8+ hours and hate having a loose controller that I have to search for after every time I set it down. Thank you for commenting Scott! This was the first time I've tried the plow so still trying to figure things out in my little driveway. Thank you for the suggestions. Just out playing in the snow were you? Hope your new suit comes in soon along with the studs. I'm sorry, but I'd already be tired of cold riding ... wait a minute I packed it in at 15 degrees above what am I talking about! I am way softer! Yes, just playing in the snow... This year I really don't intend to ride just because I can. When the snow is really heavy or it gets really cold I'll use another form of transportation. Richard, my controller was forever loose and only just a week ago did I mount it permanently (and firmly) to the dash so I don't have to cradle it in my lap. I think the PO kept the cradle that was originally there and I was just too lazy to mount it correctly. A couple of other small maintenance items taken care of so at least on this front I should be ready. Too bad everything else around here isn't as prepared. Have fun moving snow sitting inside! It came with a dash mount but I figure it'll take a while until I figure out what works for me. I still need to pick up some ballast for the rear of the truck. snow....I'm not even ready to see any of that. Not too much in AZ? Or are you still in MT? 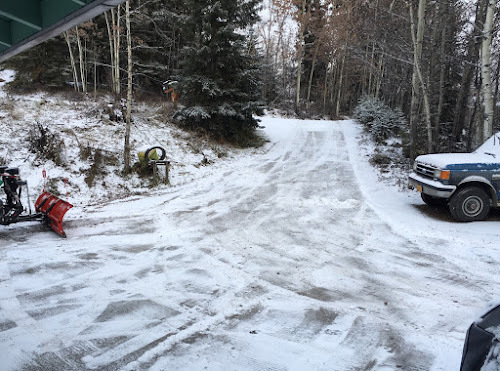 So for your snow plow practice, no studs on the truck tires or there are studs? No studs on the truck tires just M&S. Though I do have chains for the truck and would probably need them in deep snow or ice. I like that first pic Richard. 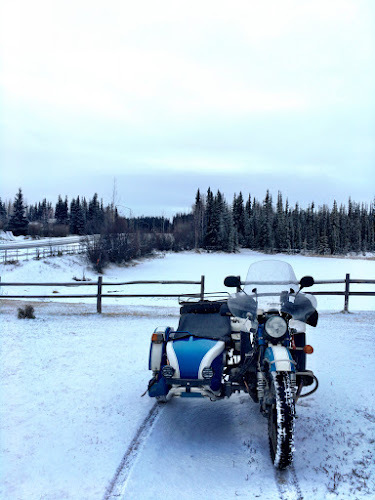 The blue and white Ural goes very nicely with the snow. Do you drop the pressure at all in the pusher tire for more traction? Or does this cause the rig to wander? And evidently you need two suits, you don't realize how much you use it/miss it until you don't have it. The Western plow is a good one, I used to sell these when I worked for a truck building company. Never used one, but I always though plowing snow would be one of those fun chores. Oh darn, I guess I better go plow the driveway again, (sitting in a warm, heated truck with a hot cup of coffee, listening to CBC Radio). No, I think that given how easily the rear tire is to break free of the rim I suspect that it could easily spin if the pressure is reduced significantly. Two suits would be nice though I'm hoping that not having one is a rarity. So far, snow plowing seems to be one of those "fun chores". I'm not ready to even contemplate snow and hopefully we won't get any here! But I guess it was inevitable for you. Pretty cool you have a plough on your bike! We are supposed to have a very wet winter, today we had such heavy rain that my garage had 3 inches of water in it and it was rising. Eeeek! No plow on the Ural though that would be different. It's on the 1 ton 4WD truck. Snow is inevitable here and some were getting worried that there wouldn't be enough to keep the cold from sinking too far into the ground. Snow is a wonderful insulator. Snow beats flooding. Hope things improve quickly!